The Maganza family owned the most prolific pictorial workshop in Vicenza between the 16th and the 17th century. Their artworks, in line with the ideas of the Counter-Reformation, can be found in almost all the religious buildings in Vicenza. The founder of the family Giambattista Maganza il Vecchio (called Magagnò) was born in Calaone (Este) around 1509 and died in 1586. He was a painter and a poet who was trained in the circle of Alvise Cornaro. A member of the Olympic Academy, he created the costumes for Oedipus the King, the first opera ever represented at the world-famous Teatro Olimpico in Vicenza. He painted the frescoes in villa Repeta in Campiglia dei Berici (later destroyed) and also, most likely, some of those in villa Eolia in Costozza. He was without doubt an eclectic artist, influenced by Veronese, Tintoretto and Bassano. His son Alessandro Maganza was born in Vicenza in 1556. After being trained in his father’s workshop, he stayed in Venice for some years, where he appreciated mostly the works of Palma il Giovane. From 1580 he worked almost exclusively in Vicenza, making a great number of paintings for the churches of the city and its surroundings (often with the collaboration of the other artists in his workshop). The most relevant ones are the five episodes of the Passion of Christ (in the Cathedral of Vicenza) and the cycle for the Chapel of the Rosary (of Santa Corona in Vicenza). His total agreement to the spirit of the Counter-reformation brought him to stray from the experience of his father: he repudiated Veronese and he opted for dark tonalities, giving to his paintings the only task to teach the truths of Faith. Alessandro died around 1630, after having trained four of his sons for painting: Giambattista il Giovane (1577-1617), Marcantonio (1578-1630), Girolamo (1586-1630) and Vincenzo (born in the last decade of the 16th century). Among all of them, only Giambattista il Giovane distinguished himself for a detachment from his father’s style by using a richer and vivacious palette along with the taste for decorative details, as can be seen in the Martirio di Santa Giustina (S. Pietro’s church in Vicenza). 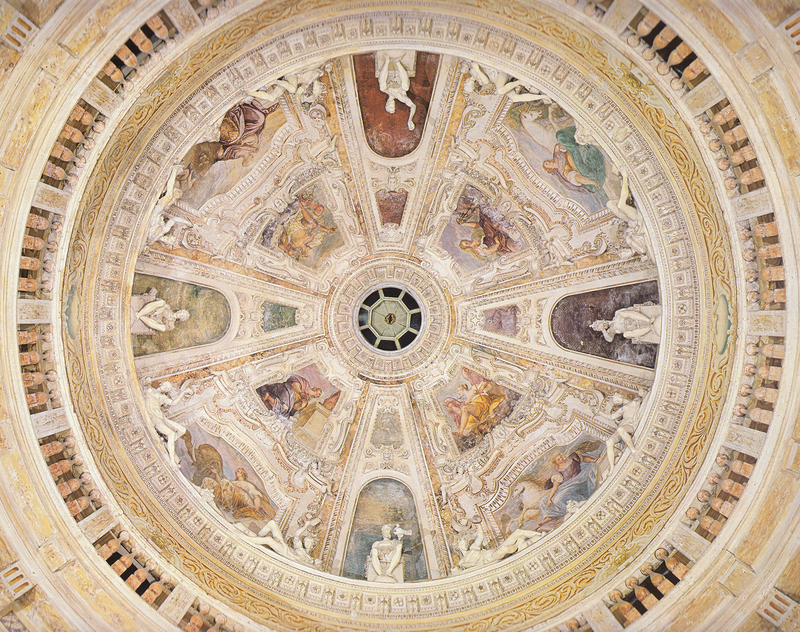 He made some frescoes of Villa La Rotonda with his father Alessandro, such as some panels on the ceiling and the Allegories in the cupola.